Mississauga, a young, mostly suburban city of 700,000, was struggling with its downtown as it offered little to its residents in terms of attractive public places and destinations. But now with the creation of a new city department," Building a City for the 21st Century," Mississauga is exercising its potential to create connections between its civic institutions and to grow a lively downtown with public spaces where people would gather. This department was inspired by and modeled on the PPS approach that began over a year ago. In June, 2005, PPS led training workshops and presentations for over 200 City staff from all departments, including politicians and senior management, recognizing that the concept of Placemaking applies to a wide range of the services delivered by municipalities. Planning began in earnest in October, when PPS led community workshops to develop a program of uses for the under-performing public spaces around the Civic Centre (City Hall, Central Library and Living Arts Centre), and create a vision for a downtown park adjacent to City Hall that will form a centerpiece for new residential development. In January 2006, PPS presented preliminary concepts to a public meeting attended by over 150 people, and then refined the plans further based on their input. This project was a close collaboration between PPS and City staff that became an integrated campaign to improve Mississauga as a place to live. City staff extended the public involvement by running 17 community focus groups at schools, community centres, Rotary clubs, and with many other community groups that usually do not attend the public meetings. In total, the team directly involved over 1,500 residents and City staff. The Building a City for the 21st Century department was formed and has begun implementing the Placemaking programming recommendations. It also focuses on building community capital, which will make Placemaking the standard approach to City projects, i.e. an approach in which the community leads the projects. An ambitious summer schedule of programs and events has been organized that will begin activating the downtown spaces. Activities and events range from Farmers markets to Vintage Car Club Thursdays. As a result of the very positive media coverage received from local and national newspapers, other municipalities in Ontario have started similar Placemaking processes, including Burlington, Waterloo, London, and Cambridge. Finally the Mississauga Placemaking project was chosen as one of 40 semi-finalists from among 112 proposals from 12 countries for an International Innovation Award given each year by the Commonwealth Association for Public Administration and Management (www.capam.org). 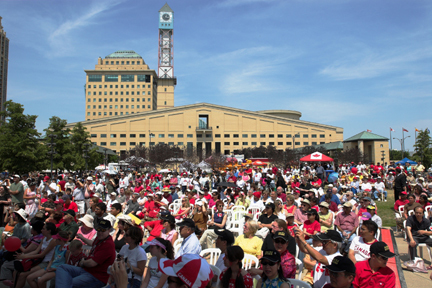 As a result of the extensive "Placemaking" workshops conducted in 2005 and 2006 by PPS and the City's Community Services department, Mississauga has begun to turn its downtown public spaces into vital community places. Community stakeholders, including citizens, arts and sports groups and businesses were consulted to develop a Vision Concept Plan for public space surrounding the Civic Centre. As a result of public meetings, workshops and web-based reviews of draft plans, the final document, Building Mississauga around Places: A Vision for City Centre Parks and Open Spaces in the 21st Century, was completed in January 2007. The City of Mississauga is moving forward with plans to redevelop two City Centre squares and develop a new downtown park, based on the principles of "Placemaking." The squares are located between the Civic Centre and the Central Library, while the new park is located west of the Living Arts Centre and north of the recent Daniels development. City staff and a consultant team are working towards developing the projects' draft concept plans for presentation to the public this spring. Construction of the new park is scheduled to begin in late 2008. Redevelopment of the Civic and Library Squares is scheduled to start in 2009 and will be completed in phases. The completion of these two major projects will begin to implement the Vision Concept Plan established through Placemaking, and to support the on-going programming efforts of My Mississauga.